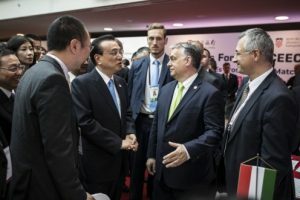 During the China–CEEC Summit, the Hungarian Prime Minister, Viktor Orbán, announced that the construction contracts on Budapest-Belgrade railway will be soon signed. The Prime Minister said that the infrastructure project will be implemented with Chinese financial and technical contributions. “This railway link is region’s most significant infrastructure project. The corridor will offer the fastest freight route between China and the Western half of Europe and forms an integral part of the One Belt, One Road initiative designed to promote free trade,” Orbán said. In 2018, Hungary’s Ministry of Foreign Affairs announced that the documentation tender for the construction of Budapest-Belgrade railway line was requested by thirty companies, of which two consortia submitted valid applications, both being Hungarian-Chinese joint ventures. On Hungarian territory, the railway project has a total value of EUR 1.65 billion and involves the modernisation of a 166-km rail link between Soroksár and and Kelebia, at the border with Serbia. Belgrade-Budapest railway line will have a total length of 370 km and it is estimated at USD 3 billion. According to the estimations, the Budapest-Belgrade line should be completed by 2023.